Polaroid Cube+ is well known as Life Style Action Camera that assists users in efficient recording of all adventurous of life. Same as the original Cube, this device also inherits 1.4 inch cube shape but the imaging capabilities are much improved as compared to its predecessors. This device can provide 1440p resolution level at 30fps whereas 1080p can be captured at 60 fps. In case of 720p you will be able to manage frame rate of 120fps with slow motion recording abilities. Other than this, your Cube+ camera can capture images at 8MP and the advanced image stabilized feature is also added to this design. It can definitely make all your videos much smoother and impressive one. The built in type Wi-Fi connectivity offers easy synchronization with Android as well as iOS devices via Cube+ application. This application will provide you so many advanced editing and control options so that captured images and recorded videos can be easily saved, printed or shared on other platforms. All these advanced features make this device stand in top choice list of athletes and adventure sports lovers. No matter whether you are a professional or beginners with action camera series, Polaroid Cube+ will offer you intuitive controls with user friendly interface so that everything becomes much easier to manage. This action camera comes with so many attractive accessories that can make your purchase worth useful. You will get a standard tripod mount of ¼-20 specification but the sad part is that it is made up of plastic material. All these mounts are designed with quick connect type clip system that assists users in easy connection and disconnection between mount and camera. This clip can be easily fixed with tripod socket of camera and then it perfectly slides over mount leading to a safe lock. If you want to mount this device on helmet or handlebars then you can take benefit from socket and ball mounts available with this device. You can also buy additional accessories from online stores to make your device more suitable for action photography. If you want to use this device under water then it is important to buy additional dedicated protective housing as it is not available inside your package. Also you can buy some additional mounts online to set up your camera at rough and difficult positions. Top resolution level of this camera is listed up to 1440p that works with 30 fps frame rate. This device cannot record footage with 2560x1440 pixels that is known as wide screen type resolution but you will be limited to 1920x1440 pixel level. This resolution level serves with 4:3 aspect ratio. In case if you want to record videos with wide screen focus then it is good to switch to 1080p resolution or to 720p level that provides 16:9 aspect ratio. The videos can be developed with high quality digital image stabilization and it works perfectly with snowboarding, bike riding and moving car like motion oriented scenes. Users can also introduce some impressive effects into their fast moving videos to get customized results. The photo resolutions of Polaroid Cube + can be switched between 3MP, 6MP and 8MP level as per need. The files are produced with JPG compression so file size usually vary with changing resolution level. You will be glad to use its self timer feature that can be adjusted to 3 seconds as well as 10 seconds for capturing any still image. This camera does not contain any screen so users definitely need fast connectivity with smart phone screen so that footage can be viewed at the time of recording. This device comes with built in Wi-Fi facility so it is much easier to connect your action camera with Android as well as Apple devices. With this remote connectivity option you will be able to have wide variety of options for basic controls as well as for video shooting. The Cube+ application is designed to serve users with easy switching between physical buttons and software initiated controls. Users can easily change settings from remote location to adjust time lapse, photo modes and video modes. If we talk about battery life of Polaroid Cube+ device then it will not give you much pleasure; with HD recording your camera can serve you only up to one hour. You have to connect it via USB port for charging and it takes about one hour to complete full charging. In case if you need a camera to shoot your full day shoots on adventurous trips then definitely this is not right choice because you cannot remove or replace its battery. With this fixed and limited power source it becomes difficult to get services for long hour usage. The camera can accept MicroSD card up to maximum capacity of 128GB and you can easily add MicroSDXC and MicroSDHC cards to this unit. As videos are heavily compressed with JPG type compression technology so, there is no need for any fixed MicroSD card speed limit. You will find the SD card slot at backside of your camera that is hidden below protective cover. 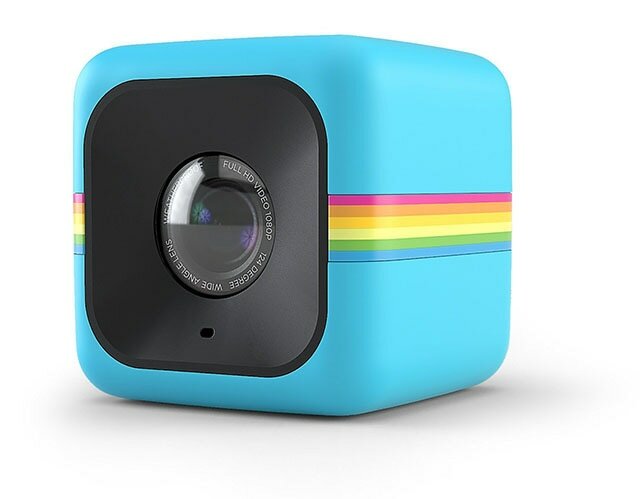 After observing all incredible features we can say that Polaroid Cube+ is a classic device for action camera seekers. It possesses variety of controls and advanced user friendly interface. Some people have reported negative results for its audio abilities and sometimes the controls also freeze up while switching between physical buttons and smart phone application. Professionals as well as beginners love its image quality and the intuitive controls that make everything much easier to access. This action camera falls in reasonable budget range but still offers all competing results. You can order your product from online stores as well as go to buy at local retail stores.